I am asked all the time by my clients and friends whether they should be taking supplements, and if so, which ones. A few years ago my answer would have absolutely been, NO. I used to think everyone should get all their vitamins, minerals, and nutrients from their food and other natural sources. But, unfortunately, the more I learned, the more I realized just how depleted our food supply actually is in vitamins, minerals, and nutrients. When I think about it, this makes sense. How can food that is shipped 1/2 way around the world, kept in storage facilities for days on end, and then sits on the supermarket shelf for another few days have the optimum amount of vitamins, minerals and nutrients that my body needs? How can the soil that we have abused for so many years with herbicides and pesticides still grow vegetables with the same minerals that used to be in our soil? The answer is, it can not. The cost to be scanned is $10 and all the money raised from these scans is donated by Jenn, to an organization called Nourish The Children www.jkhd.millionsofmeals.com. I did an event a couple of months ago on the importance of juicing and how juicing boosts your antioxidant levels. I had the scanner at this event and in a room of 25 people, I had the highest antioxidant level, a fact I am quite proud of, but I share this not to brag, but rather to illustrate that the scanner works! All my friends who live a healthy lifestyle also score high. In addition, everyone I know who uses the supplements from Nu Skin have high antioxidant levels and I must say, they all look healthy, vibrant, and young! One such person is Ian Ziering from 90210. To my excitement, I met him in person about a month ago, and he was looking good! I had no idea he is almost 50, in all honesty, he looks like he is in his early 30s. If you are like me and you grew up with 90210, you understand why it was so exciting to meet Ian in person. There are a few opportunities for you to meet him this week in Fairfield and at the same time have your antioxidant level tested. See below for all the information. I strongly encourage everyone to know what their antioxidant level is. Knowledge is power, and to know your antioxidant level will allow you to adjust your diet accordingly, and also figure out which supplements are best for you. Nu Skin has a few supplements that they guarantee will raise your antioxidant level in 60 days or they will refund 100% of your money. Ask my friend Jenn about lifepak, g3 juice and others. If you mention my blog she will give you a 35% discount on everything you order. For more information call Jenn DelAngelo at 203-610-0015 or e-mail at jenndelangelo@me.com. Meet Ian Ziering and have your antioxidant levels tested . . . Some of you may have heard some chatter recently about GMOs, but I am guessing most of you are asking yourselves right now, "what the hell are GMOs?" When I first learned about GMOs a few years ago, my initial reaction was a mixture of fear and anger. You should expect a similar reaction, especially if this is the first you are really hearing of GMOs. It is my hope that this blog, and all my blogs for that matter, will help you make educated decisions about the food you eat. No matter what you decide in terms of eating GMOs or not eating GMOs, you should at least have all the necessary information. So, please read on! First of all, GMOs are NOT real food. GMOs are genetically modified organisms that are produced by taking the genes from one species (i.e. animals, plants, bacteria or viruses) and literally forcing those genes into the DNA of a food crop or an animal to introduce a new trait. Does that even sound like food to you? Sounds more like science fiction to me. GMOs were created by biotech companies in order to make a lot of money. But, the last time I checked there were no biotech companies necessary when growing vegetables or raising an animal, right? That used to be the responsibility of farmers alone. So how did biotech companies get involved in our food? It's a really long story. You can read that story in the fantastic book "Seeds of Deception" by Jeffrey Smith. But essentially, GMOs are the result of what happened when biotech companies got greedy, the government neglected to regulate and protect Americans (I use the word neglected very loosely as this was a purposeful oversight), and the American people were taken advantage of. I assure you this will not be the last you hear from me about GMOs, however, most importantly I want you to read this post and have an understanding of the follow things: (1) What are GMOs; (2) What are some the health risks associated with eating GMOs; and (3) How to avoid GMOs. 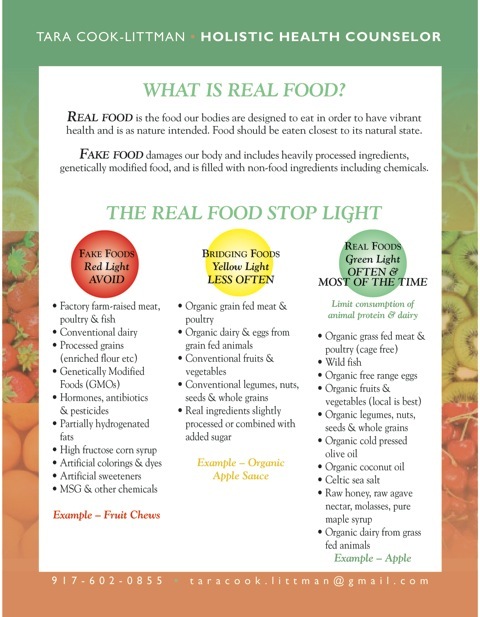 The following information will help you in your every day life to avoid GMOs. There are currently five widespread GM Food Crops on the market: (1) Soy; (2) Corn; (3) Canola; (4) Cotton; and (5) Sugar Beets. GMOs have been engineered to be either herbicide resistant, pesticide producing, or both. Many dairy farms in the United states are also injecting the cows with a genetically engineered hormone called rbGH or rbST. Herbicide resistant crops are able to survive a high dose of herbicides which are used to kill weeds. You can imagine that when the crop is resistant to a particular herbicide, the farmers can spray extra herbicide to kill the surrounding weeds which means a much greater herbicide residue on the vegetable crop being grown specially for you. One particular herbicide resistant crop is the Round Up Ready Soybean. The company, Monsanto, engineered a Soybean that is resistant to Round Up and now currently sells the herbicide as a package with its Round Up ready soybean seed which accounts for at least 40% of the companies annual revenue. A small amount of Hawaiian papaya, zucchini, and squash have also been genetically modified to resist a plant virus. Previously there were GMO tomatoes and potatoes but they have been taken off the market. Pesticide producing crops include corn and cotton. A gene from BT (Bacillus thurgiensis), a bacteria found in soil, was inserted into the plant's DNA which then caused the crops to literally produce their own pesticide by secreting BT toxin. Essentially, pesticide producing crops have been engineered to release their own poison. Cows, like humans, produce their own hormones. Bovine somatotropin is a hormone produced by the cow's pituitary gland. Through technology, the hormone can now be created in labs and delivered to a dairy farm near you under the names rbGH, rbST, or artificial growth hormone. Let it be known that the United States is the only developed country where it is legal to use these artificial growth hormones in cows that are producing dairy for human consumption. Australia, Cananda, Europe, Japan, and New Zealand have all outlawed the use of artificial growth hormones. Does that concern any of you? If using artificial growth hormones is too dangerous for the citizens of all those countries, it's too dangerous for Americans as well. I used to believe that if I could buy it in the supermarket, it wasn't dangerous. Afterall, the USDA and the FDA had my back. I had faith that our government was doing extensive research and testing on everything we ate and I was certain that if something was potentially harmful to humans it would be banned. Or so I thought . . . until I learned that there has been little to no testing done on the possible risks associated with GMOs. There have been NO human clinical trials despite the fact that all drugs have human clinical trials. The animal studies that have been conducted on GMOs had startling results with major impacts on the animals that were fed the GMOs. Despite there being warning signs, GMOs have been on the market in America since 1996. Has anyone else noticed a major decline in our health since the late 90's? I have listed below a few of the most startling health risks associated with eating GMOs. This is far from a complete list. GM soy found in so many foods today actually impaired the digestion in mice by reducing digestive enzymes and that may make you sensitive or even allergic to different foods. Mice that were fed the BT-toxin found in the pesticide producing GMOs began to have immune reactions to harmless foods. For me, this is one of the most disturbing possible risks because everywhere we look today children are being diagnosed with nut, wheat, dairy, soy and other allergies. Even adults, who were never allergic to foods before are all of a sudden having allergic reactions. Why might this be happening? GMOs may be a major contributing factor. In the animal studies done on rats and mice it was shown that more than half of the mother rats who were fed GM soy had babies that died within three weeks of birth. The longer Mice were fed GM corn, the less babies they had and the smaller the the size of the babies. After three generations of hamsters being fed GM soy, most of the hamsters were not able to have babies. When weeds are systematically doused with high levels of herbicide, the weeds begin to build up a tolerance and resistance to these herbicides creating super weeds. The biotech companies respond to super weeds by instructing farmers to spray more herbicide and by creating new, more dangerous herbicides. One of the challenges with showing the health risks associated with GMOs is that it may take some time to fully realize the damage to our health. For example, it was only recently that we have realized the negative impact on our health from trans fats and high fructose corn syrup, even though they have been in our food for decades. GMOs may have a lasting impact on our DNA, and the DNA of plants and other living things. Unfortunately, because there have been no clinical trials, we won't know for sure until more time passes, essentially we ARE the clinical trials. Avoiding processed foods is one of the best ways to ensure that you will not eat GMOs. In America today at least 90% of all processed foods contain one or more GMO ingredient. We are completely unaware of this fact because there are NO laws requiring manufacturers to label a food as a GMO. For this reason it is very important to read the ingredient list when buying processed and packaged foods. Unless the sugar is listed as cane sugar, it is almost certain that you are eating a GMO. Be aware that GMO ingredients have aliases and they may be difficult to spot. Some hidden GMO ingredients include; aspartame, baking soda, caramel color, corn flour, corn sugar, corn syrup, dextrose, fructose, protein, lecithin, malt, maltodextrin, sorbitol, sugar, soy sauce, soy lecithin, vitamin E, vitamin B12, and xanthum gum. I challenge all of you to find a processed food on the market without at least one of those ingredients. Please go to www.NonGMOShoppingGuide.com for a complete list of hidden GMO ingredients and other tips for avoiding GMOs. The USDA has a rule forbidding the use of GMOs in organic food products. So, if you are buying organic, you are avoiding GMOs. It is important to note there is a risk that the GMO crops have cross-pollinated with some of the Non GMO crops. But, at this point there is nothing we can do about the potential risk of cross-pollination until GMO crops are no longer planted. Always buy organic meat. Animals raised at non organic factory farms are given GMO feed. If GMOs are making us sick, they are making the animals sick too. If you are going to eat animal protein, it should be from animals that were healthy. In addition, when buying dairy please remember that the statement "made from cows not treated with rbGH or rbST" does not mean that the cows were not fed GMO corn and soy. The dairy must be labeled organic to ensure that the cows were not fed GMOs. Farmers producing organic dairy and raising animals for organic meat are not permitted to use GMO feed. If you want to be absolutely certain that your food does not contain GMOs, look for this label. The Non-GMO Project is a non profit organization that is dedicated to ensuring that foods are clearly labeled and are also independently verified as not containing GMOs. The Non-GMO project seal is the best way to ensure that your food does not contain any GMOs. You may see other Non-GMO labels, but, I do not recommend taking those labels at face value. They are not regulated and different manufacturers use assorted testing methods and have varying thresholds as to what qualifies as Non-GMO. For instance, one manufacturer can decide that if the product contains less than .1 percent GMO then it can have their Non-GMO label, where as another manufacturer can decide that anything less than 2 percent GMO can be labeled Non-GMO. My hope is that GMOs don't have a future. I honestly think GMOs are a scifi thriller movie in the making. I can already see the movie preview, 'genetically modified corn about to hit the markets but it contains genes of a bacteria that threaten to kill millions of Americans. Their only hope is the lone USDA whistle blower who is trying to expose the danger but is in danger himself of being killed by hitmen who were hired by the company that created the seed of this corn and is about to make a stealth profit from the sale of the genetically modified corn seed'. I hate to be the one to tell you, but this hypothetical scifi movie is actually not so far removed from reality. Remember, my approach with everything is to implement changes into your life slowly so that the changes stick and you do not overwhelm yourself. If the prospect of completely eliminating GMOs from your diet right now feels too overwhelming, take a step back and evaluate what smaller steps you can take to begin replacing GMOs with non GMO foods. For a start, try replacing your Tostito corn chips with an organic or NON GMO Project brand of tortilla chips. Eliminating GMOs from your diet is possible, one change at a time.